Fiji fan palm is a beautiful, medium sized quick growing palm native to Fiji in the Southwest Pacific. This palm will grow up to 30 inches with a straight smooth trunk with some fiber patterning at the base. It has numerous palmate leaves which are very large and nearly as wide as long. The shallowly split leaves are rich lime green with a yellowish midrib. This ornamental palm has fragrant brownish flowers. The spherical fruit is 11-12 mm in diameter, turning red then black at maturity. The seed is 7mm in diameter. 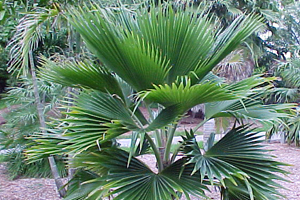 Fiji fan palm prefers partial shade or partial sun to full sun. The soil should be moist. It requires bright light and high humidity. The propagation of this palm is through seeds. Fresh seed germinates within 30 days. Transplant the palm at 1" depth using a well draining soil mix. Plant in a sunny, moist, but well drained position. This slow growing palm is well suited for coastal areas.